Being able to discover, interpret, and communicate data is everywhere we look in the digital age. Analytics is not only a word for Google but everywhere you look, especially in sports. The ability to not only discover statistics but interpret their usefulness and communicate it to others can be game-changing in sports – from a “Moneyball” approach to team management to building a market for an individual, team or product. As the Influencer (INFLCR) brand grows across the nation, founder and CEO Jim Cavale is taking time to speak to some of the best and brightest minds in the world of sports analytics. Cavale was invited recently to give a presentation at the Samford University Center for Sports Analytics, part of SU’s Brock School of Business in Birmingham, Alabama – the only sports analytics program in U.S. higher education. 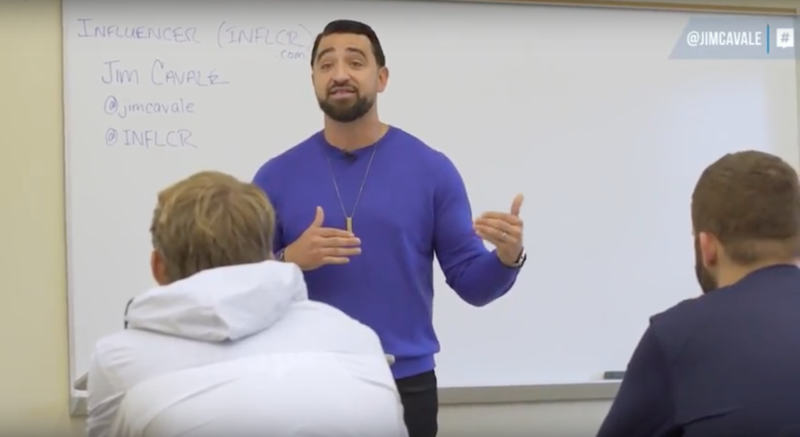 Cavale shared with these sports marketing students how INFLCR aims to organize, equip and develop the brands of college athletic departments and their teams, by leveraging technology to streamline a partnership with their student-athletes on social media. The INFLCR software provides a CRM database to organize social media and data for college athletics programs and then helps these programs equip their student-athletes with their internal content, to improve the brand of both the student-athlete and the team. “I see a problem when it comes to, not just sports, but brands in general on social media not being connected to their brand ambassadors. Teams work on distributing content and messaging for their team’s social [media] accounts, but what about the recruits? What about the current players? What about their key alumni? They represent their team as well, right? I wanted to build something that will help teams protect their brand but also grow their brand,” Cavale said. Sports brands are the daily market for these sports analytics students, led by Dr. Darin W. White, executive director of the center. This is a program that is producing sports analytics projects for the Southeastern Conference, Minor League Baseball, the NBA and the Miami Dolphins, among others. They have also worked for companies such as Nike, Adidas, Honda, Blue Cross Blue Shield and more. Cavale shared that this need is growing each year to study the impact one player or team’s post may have on themselves, their team and their sponsors – especially as social media grows to include live video. “The player and the team is becoming more of a broadcaster every day,” Cavale said. A good example of this, which Cavale shared, is Pittsburgh Steeler wide receiver Antonio Brown (@AB84) posting a Facebook Live video in the team’s locker room following a playoff win over the Kansas City Chiefs in January 2017. Brown was fined $10,000 by the Steelers for violating the NFL’s social media policy. But as Fortune reported the previous summer, Brown, fresh off a “Dancing With the Stars” appearance on ABC, was one of many professional athletes and celebrities Facebook is paying to use its product in front of his 676,000 followers. That price was later revealed to be in the “high six-figures,” a financial win for Brown and boost in exposure. Deals such as this, and building a following on social media, are just one way athletes have potential to leverage their platform to think beyond ball for life after sports. But even if it’s not a big-time NFL endorsement deal like Brown’s, there are plenty of ways to leverage your personal brand as an added asset to grow your career after the jersey is gone. This is the passion behind INFLCR’s initial launch in the college sports niche.